Take the Fruit Garden Tour! Correct Varietal selection is imperative. Some varieties that have done reasonably well in Western Washington are Gillette (most reliable), Desert King (or King), Vashon Violet (AKA Brunswick, best taste but not as productive), and Lattarulla. 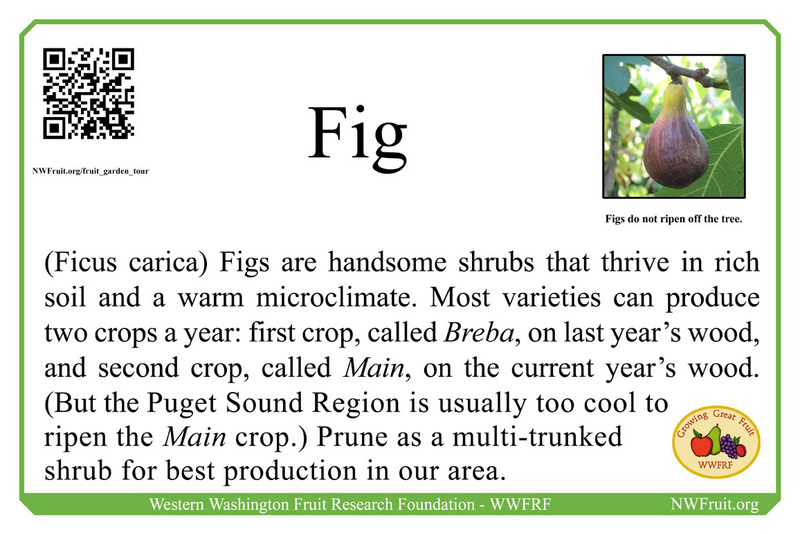 About 90% of the Fig trees sold in Western Washington as “Brown Turkey” are not Brown Turkey but other varieties that have been mismarked. Breba fig developing in early April. If possible, plant in a warm microclimate such as near a south facing wall in full sun. Prune about 1 out of every 3 limbs back to, or nearly back to, its source each spring to encourage renewal growth. The new shoots forced to grow as a result of pruning will produce their Breba crop the following year. They taste best if picked when soft to mushy and drooping straight down. Some figs are green when ripe and others are darker.